Can you remember the first card trick you ever saw? It leaves an impression on most, and that’s the lasting magic that goes with the trick. Turns out card magic can also improve your game and hand dexterity, even if you have no aspirations to be the next Great Big Majestic Master of Card Tricks. My first footsteps into card magic came early, but kind of crept up on me: While holding my first new deck, I realized it felt almost alien compared to the vintage decks I’ve held before. I needed to familiarize myself with the way the deck felt. As an ex-guitarist with arthritis, there’s also a huge need for developing hand dexterity. Thus, I started shuffling, searching and playing around. In less than a week, my hand dexterity had improved, and my typing speed was back to where it should be. You likely have an inspiration for card magic already, and that’s the best starting point: Who do you dig? Anyone who just looks so damn cool you can’t help but watch it twenty times? Start there. Look at Dynamo (for KISS FM), David Copperfield, David Blaine or whoever catches your fancy. Some, like The Card Trick Teacher, apply their skills to teach. Pay attention to how your favourite magicians hold the deck. Zoom in for a close-up thanks to the wonder of technology. You want to holds the cards in such a way that it does not impede the movement of the rest of your hand (try the one-handed shuffle unpracticed – you will see). Make sure that you can show off the deck to a person or crowd, that you can interchange the deck. Cutting precisely in half is a practised skill that uses both your eyes and your hands. If you can’t feel it, look at it; if you can’t see it, feel it. Cut the deck into two (or three) just by sight or feeling and count the number of cards. The more you do this, the better you’ll get. Take a look at some of these YouTube videos for the basics of how to do some of the first card-sleight tricks. We can’t finish off this discussion without pointing you towards some stunning magic card marked card playing card decks from ELLUSIONIST. My nephew showed up at our summer cabin last year with a few of these decks and his card magic was phenomenal. As well, the decks are beautiful. 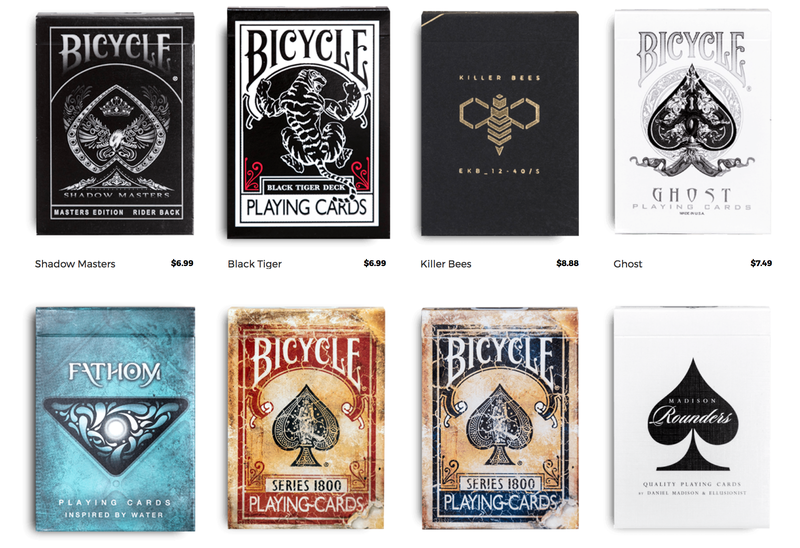 Check it out – http://www.ellusionist.com/. Be sure to click on The Tricks page.